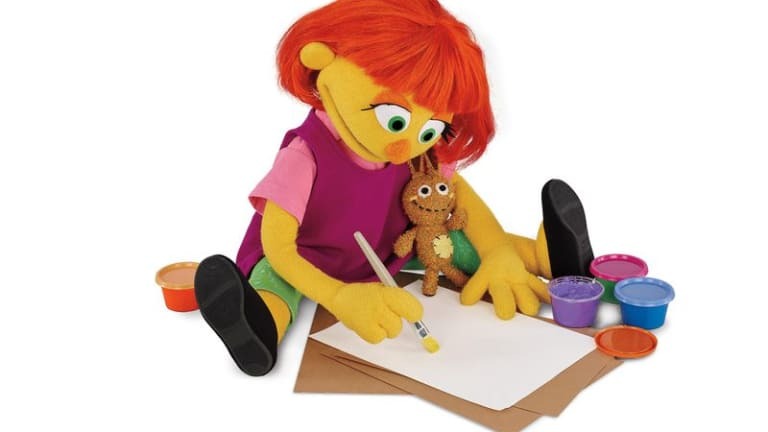 In honor of Autism Awareness Month, Sesame Workshop launched new videos and materials featuring the family of Julia, a 4-year-old Sesame Street Muppet with autism, as part of its Sesame Street and Autism: See Amazing in All Children initiative. New resources, freely available in English and Spanish on sesamestreet.org/autism, bring to life Julia’s parents, big brother, and companion dog, and focus on what all families share in common while providing tools to help overcome everyday challenges. Additionally, on April 8th, HBO and PBS KIDS will premier a Julia-focused Sesame Street episode in which Elmo, Abby Cadabby, and Alan help Julia feel less scared about getting a hair cut – a piece created in response to a need families have expressed for materials tackling common experiences and challenges that families like Julia’s face. In addition to the new resources, Sesame Workshop is continuing efforts across the United States and worldwide to expand the initiative. Building on Sesame Place and Beaches Resorts achieving distinction as Certified Autism Centers (CAC) last year, SeaWorld Orlando was recently designated as a CAC, completing staff-wide autism awareness training and adding quiet spaces for children and families. In addition, Busch Gardens Tampa Bay will now feature meet and greets with a Julia walkaround character, adding to the growing list of themed entertainment partners featuring Julia. In Japan, where Julia is the face of a diversity and inclusion curriculum taught in Japanese public schools, Sesame Workshop will participate in the World Autism Awareness Day Symposium and join the Tokyo Tower lighting ceremony.